Esther Tablas collaborates as a dancer in some of the most important companies such as Ballet-Theatre Rafaél Aguilar Company, Rafael Amargo Company, Dançem and Antonio Márquez Company. 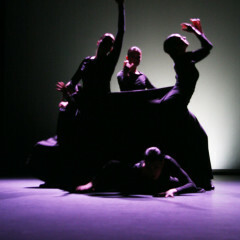 From 2013 Esther Tablas takes over the direction of Rajatabla Danza and dedicates the company exclusively to dance productions, but keeping the original mission: to develop dramas that deal with current themes of modern society and research into different plastic arts and musical languages for creating shows of Spanish Dance. Rajatabla Danza renews the language of Spanish dance in its productions, while combining traditional character with deeply popular roots, and its projection into the future, for their creative and refreshing possibilities. Rajatabla Danza values the Spanish dance as a universal language of communication with society, claiming its ability to transmit and to moved, involving the public, making the audience feel identified with the topics covered and sharing its passion for this art. Rajatabla Danza opens the range of stylistic possibilities that Spanish dance has, running away from the clichéd view, but without losing its character and identity. Rajatabla Danza coordinates for each production to the best performers and technicians, forming teams working together to bring productions to the highest technical, artistic and creative level. The most outstanding productions of the company are Enfermedades del Silencio (Diseases of Silence), winner of the 16th Choreography Contest of Spanish Dance and Flamenco in Madrid, Desde la Oscuridad (From the Dark, 2012) and #am@r (#l@ve, 2014). This latest show is currently on international tour.